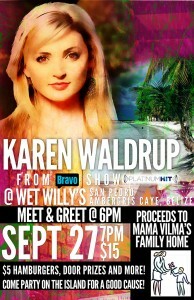 Wet Willy’s is hosting musician Karen Waldrup of Nashville, Tennessee U.S. for a “Meet and Greet” benefit concert for the Mama Vilma Family Home. Waldrup is one of the newest and brightest stars to come on to the Nashville music scene. From her humble beginnings hosting her own writers’ night, to releasing her second CD titled “With Love, Karen”, the singer has appeared on Bravo channel’s television show “Platinum Hit” hosted by well known artist Jewel and American Idol veteran Kara DioGuardi. Waldrup has been quite the musical success story that many can only dream about. Besides performing with big name acts such as Rodney Atkins at the 2009 “Salute toThe Troops” concert in Fort Campbell featuring Carrie Underwood and Hank Williams Jr., she has opened for major stars Sara Evans & Terri Clark. She has performed worldwide at numerous events and has performed at many other popular venues all over the country of the United States. In 2010, she shot her latest music video titled “Bayou Baby”, which is currently in worldwide video rotation on The Country Network. What sets Karen apart is not only her love for the music she writes and sings, but the desire to be involved in charity work. She truly cares for others and has done several events involving organizations dedicated to helping others less fortunate. Waldrup prides herself on being a female touring artist and 2012 continues to be a touring year for her. Her new album “The Beginning” is her 4th studio album which was released in May, 2012. Karen Waldrup will be performing at Wet Willy’s on Thursday, September 27th at 6PM. Admission is $15 and there will be $5 hamburgers, door prizes and much more!!! A portion of the proceeds from the event will go to the Mama Vilma’s Family Home. Come party at Wet Willy’s with Karen Waldrup and enjoy some great music while supporting a worthy cause! !